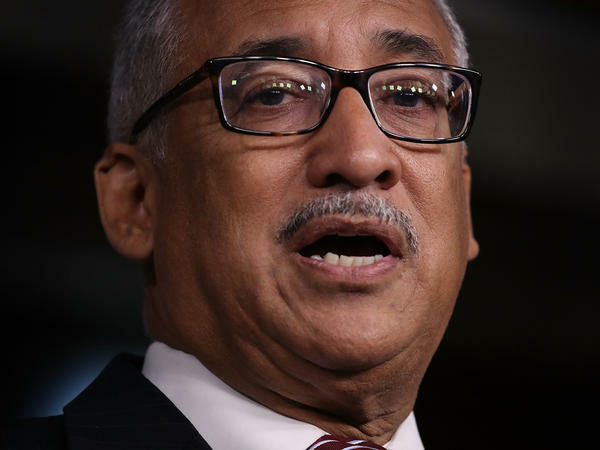 House labor committee Chairman Bobby Scott, D-Va., has shepherded through his committee a bill that would gradually raise the federal minimum wage to $15 from $7.25 by 2024. The bill also now has the support of Amazon, which last year committed to paying all of its workers at least $15 and to lobby Congress for a higher federal minimum. The House Committee on Education and Labor on Wednesday voted 28-20 along party lines in favor of the bill. It would raise the federal hourly minimum to $15 by 2024 and also phase out the so-called "subminimum" wages for tipped workers, young workers and workers with disabilities. "After nearly 10 years with no increase in the federal minimum wage, minimum-wage workers have suffered a 17 percent pay cut due to inflation," said Chairman Bobby Scott, D-Va., who had introduced the Raise the Wage Act. "The result is that there is no place in America where a full-time worker who is paid the current federal minimum wage can afford a modest two-bedroom apartment." But Rep. Virginia Foxx, R-N.C., said the bill would result in "significant job losses for hourly workers around the country" and would "hammer" small businesses by increasing the cost of labor. She called the legislation "blatantly socialist" and said it was "at best a foolish policy proposal. At worst, it's an intentionally dishonest political stunt." This is the Democrats' latest attempt at raising the federal minimum wage. It faces a high hurdle in the Republican-controlled Senate. Even so, raising the federal minimum has been picking up steam over the years. Sen. Bernie Sanders, an independent who caucuses with the Democrats, had championed the $15 minimum wage for years and campaigned on it during his 2016 presidential bid — which he's likely to do again in 2020. But this year, his Senate version of the Raise the Wage Act now has the support of many Democratic lawmakers who are running for president. More than 190 Democrats have signed onto Scott's bill in the House, which the party controls. House Majority Leader Steny Hoyer's office said he will bring the Raise the Wage Act to the House floor for a vote in the coming weeks. "One job should be enough to live in this country," said Rep. Andy Levin, D-Mich. The federal minimum wage has remained at $7.25 an hour for a decade, even as inflation makes every dollar less valuable over time. Since 2012, the "Fight for $15" campaign — backed by the Service Employees International Union — has been advocating for higher pay for workers in fast food, retail and other industries. The Raise the Wage Act now also has another unlikely backer in Amazon. In October, the retail giant became the most high-profile company to commit to paying all its employees $15 an hour — after facing criticism that its median pay was $28,446. Several other companies have raised their minimum wages or plan to do so; Target aims for $15 by 2020. "After we increased our minimum wage to $15 an hour, our employees told us they were having an easier time providing for their families and meeting their financial needs. That's why we continue to encourage other companies and policymakers to join us in this fight," Amazon's vice president of public policy, Brian Huseman, said in a statement on Wednesday. Foxx and other Republican lawmakers pointed out on Wednesday that fewer than 3 percent of U.S. workers work at or below federal minimums. That's in part because 29 states and the District of Columbia have set higher wage standards. In January, New Jersey joined New York, California and Massachusetts in committing to phase in the $15 minimum. New York City has also become the largest city to raise its minimum to $15 for businesses that employ more than 10 people. Republicans have argued that each state should control its own wage levels because of differences in the cost of living. Currently, five states have no minimum-wage requirements. "I think the weight of the evidence to date suggests the employment effects from minimum-wage increases in the U.S. have been pretty small — much smaller than the wage increases," Arindrajit Dube, an economics professor at the University of Massachusetts at Amherst, told NPR's Planet Money in November. He said, "Thirty years ago, most economists expressed confidence in surveys that minimum wages had a clear negative impact on jobs. That is no longer true today." In 2016, 52 percent of U.S. voters said they supported increasing the federal minimum wage to $15, according to a Pew Research Center survey. But opinions divided particularly by race and political leaning. The majority of Trump supporters and of white voters told Pew they opposed the increase to $15. President Trump's top economic adviser, National Economic Council Director Larry Kudlow, in November called a federal minimum wage "a terrible idea" and said he would oppose the Democrats' push for a higher federal minimum. The U.S. has had a federal minimum wage since 1938, introduced by President Franklin D. Roosevelt. The minimum wage went up to $7.25 in 2009 as part of a 2007 deal that included spending on the Iraq war, negotiated by Congress and President George W. Bush.